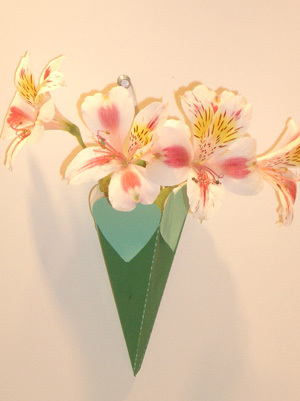 DESCRIPTION Small paper basket to fill with flowers and hang. DETAILS Do you remember hanging baskets on your neighbor's front door knobs on May Day? You rang the bell and hid in the bushes. When they came to the door, SURPRISE, your little basket of flowers was hanging on the door knob full of spring cheer. This paper basket is perfect for this activity. Print the template and cut out the objects on the page. Fold the dotted lines outward on the body of the basket. Unfold and lay flat, green side up. Run your glue stick along the tab. Turn the flattened basket over, wrong side up. Fold the left section containing the tab inward. Fold the right section in to meet the left and glue the two together. Glue the upper half of the leaves to the basket as pictured. When all are affixed, gently bend the leaves outward to make them stand out slightly. Glue the rectangular strip to the inside of the basket to make the handle and voila - you've created your own May Day Basket!